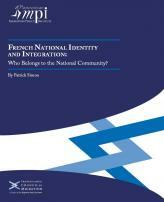 Home > French National Identity and Integration: Who Belongs to the National Community? In this report, part of a Transatlantic Council on Migration series on national identity, Patrick Simon of the Institut national d’études démographiques explores how French national identity and sense of belonging are both defined and expressed. The discussion revolves around the issues of “hyphenated identities” and whether the split allegiances of dual citizens weaken social cohesion in France. The author weighs the prevailing French perception of identity as a zero-sum game against his analysis of the identity patterns of immigrants and their descendants based on data from the Trajectories and Origins: Survey on Population Diversity in France (TeO) survey, the largest survey ever conducted in France on ethnic minorities. According to the TeO survey, nearly half of the immigrants who have acquired French citizenship have also kept their foreign nationality, and the share of binationals has grown dramatically in recent years. Meanwhile, nearly one-third of children of immigrants report dual nationality. The author argues that these trends reveal ethnic minorities’ view of multiple allegiances as compatible with a full commitment to their Frenchness. Over half the immigrants surveyed and nine out of ten second-generation respondents expressed that they “feel French.” Furthermore, the author finds that the relationship between French national feeling and loyalty to the country of origin is complementary rather than competitive; equally strong levels of allegiance appears to be the dominant pattern among immigrants who arrived in France as children and descendants of immigrants. While these findings challenge the idea that plural identities undermine national cohesion, the author’s analysis of the prevalence of “othering”—the process of labeling members of the community on the basis of visible traits that signal otherness—points to a dissonance between patterns of attachment and patterns of external perception. Nearly half of immigrants with French nationality and one-quarter of children of immigrants consider that they are not perceived as French—with figures even starker for “visible” minorities—suggesting that diversity is not yet fully incorporated in the representation of Frenchness. A. National Identities: A Zero-Sum Game? C. “Being” French or “Looking” French?